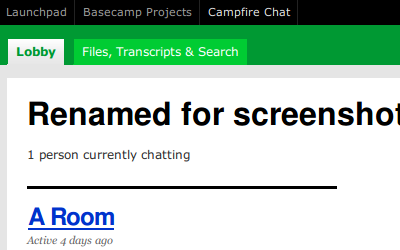 When you log into a Campfire account, you end up in what they call the Lobby, which shows you who is currently online in each room. If there are three people, it says “3 people currently chatting”. If there’s one person, it says “1 person currently chatting”. Well … that’s correct, insofar as person is correctly (or at least conventionally) pluralised to people, but I’m not sure that one person on their own can ever properly be described as chatting. It amuses me every time I see it, but it also shows how hard it can be to communicate the state of a system. One can be right and still somehow be wrong.